It all started two weeks ago when I remembered I had a 1st Communion coming up for one of my Grandsons and I better get his gift because I wasn’t the only Grandmother looking for a gift. I get these ideas in my head and then when I can’t find what I want I get frustrated; and that’s just what happened to me while I was shopping. I had decided to get him a statue of his name saint and couldn’t find one I liked. So I am now aimlessly walking around the store looking for something I do like. Finally decided to look for a card and that’s when inspiration struck. I found four cards and one I decided would make a great needlepoint design and sure I could design and stitch it in a week. (My Guardian Angle must have been taking a short nap because it didn’t jump in to say, “REALLY??? ?”…I am such an optimist sometimes. So I purchased 4 cards and a few other little things (the trip wasn’t a complete bust) and came home. Good thing my DH was driving because all the way home I was thinking about the design. And I could tell by the look on DH’s face, he thought I had lost my mind…I think if I had thought about it I would have too; but I had seen the cross immediately…so how hard could this be? By now my Guardian Angel was awake but so taken back she couldn’t so anything but keep those negative thoughts out of my head. Once home I got out my trusty computer and scanned a copy of the card into the computer. I knew I wanted the design to be about 4 inches square. I had already decided that if I couldn’t find a frame to suit me I would make a stand up or an ornament; so I wanted the size to be smallish. 4 inches give or take would be a good size, that was 72 threads, give or take, on 18 count canvas.. I used two alphabets: 9 high for upper case and 5 high for lower case. I played with the placement and once I got the lettering into place I knew how much design area I had to work with and if I was going to be able to fit the design inside lettering. 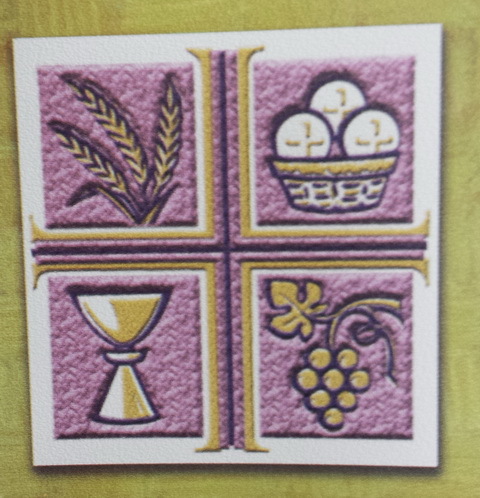 I had seen the stitches for the cross the minute I looked at the card, it was just one of those fall into place moments (trust me this doesn’t happen often). 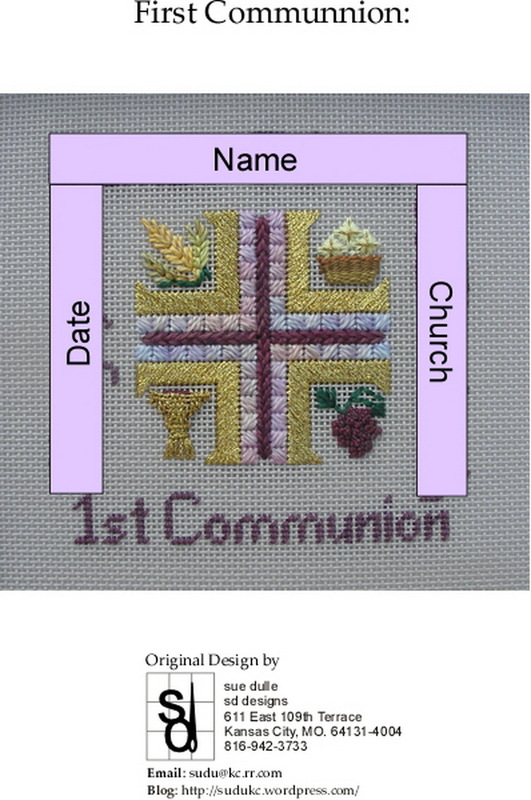 So the next step was to see if the cross would fit and still leave room for the designs. So I plotted the cross. 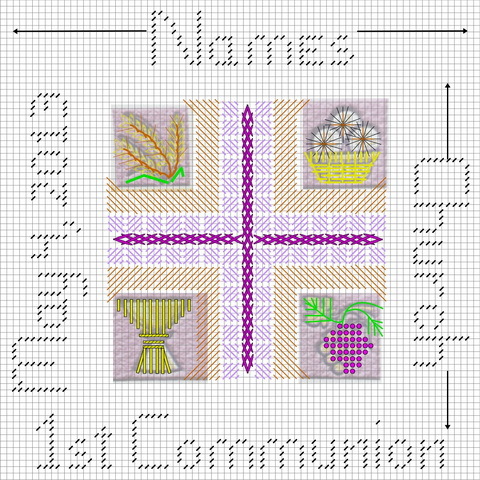 Once the cross was in place I placed small pictures of the motifs in the spaces and started plotting stitches I thought I would use. This all came rather quickly and I did not second guess myself. My Guardian Angel was working overtime just keeping me on track; she already knew this design was divine inspiration and her job was to keep all negativity away from my thoughts. 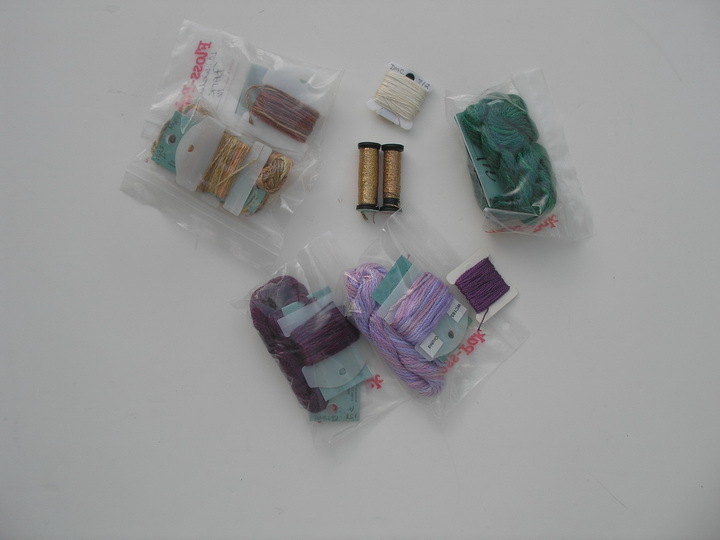 only have one with a large variety of threads and it is by appointment. I could have called the owner and if she had what I needed she would have opened for me but I was already pushing the envelope and tried to find threads in my stash. My thinking on the threads was I wanted to use threads that would wear well with young children…remember at this stage this design still had possibilities of becoming an ornament. 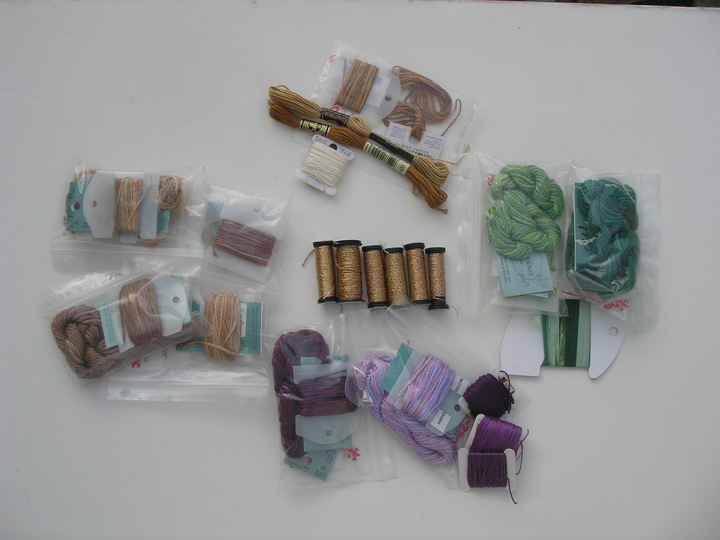 With threads pulled, canvas on stretcher bars, I sequestered myself in my stitching nest and started. Found in my haste I had made a couple spacing errors in the lettering but nothing that was going to throw the design out of line. 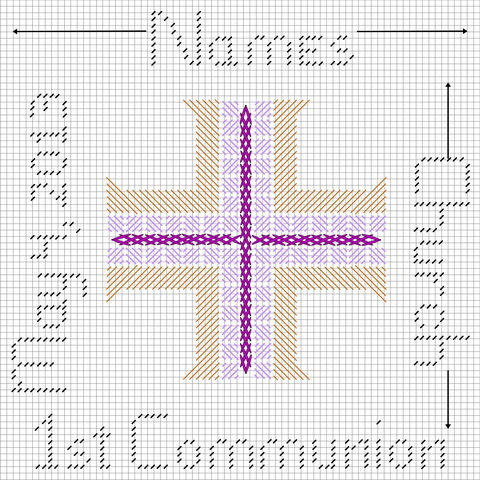 After the border was stitched I found the center of the remaining area and began the cross. The cross is my favorite part, I saw it from the minute I picked up the card and now it was stitching up just like I saw it. 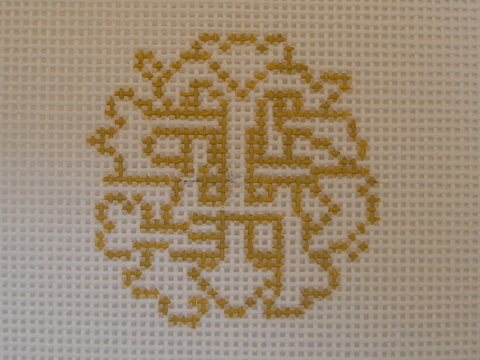 Once I got to the motifs…I had more inspiration. Why not try needleweaving for the challis…if it worked then I would needleweave the basket for the hosts too. My Guardian Angel by now was wide awake and pulling her hair out, how much could she do to keep this design on track? The challis worked out just fine and so I started the wheat. The wheat was stitched like the designed had planned but just wasn’t looking good but it would have to do for the moment. The hosts and basket were next and they too stitched up just as I hoped. The grapes I had seen as beads but at the last minute decided French Knots would be a better choice. Okay all the motifs are completed but the wheat has to be redone. It just looked awful and needed help. So I cut it out and went with a heavier thread and straight stitches instead of Lazy Daisy stitches. It looks much better and it is done.. 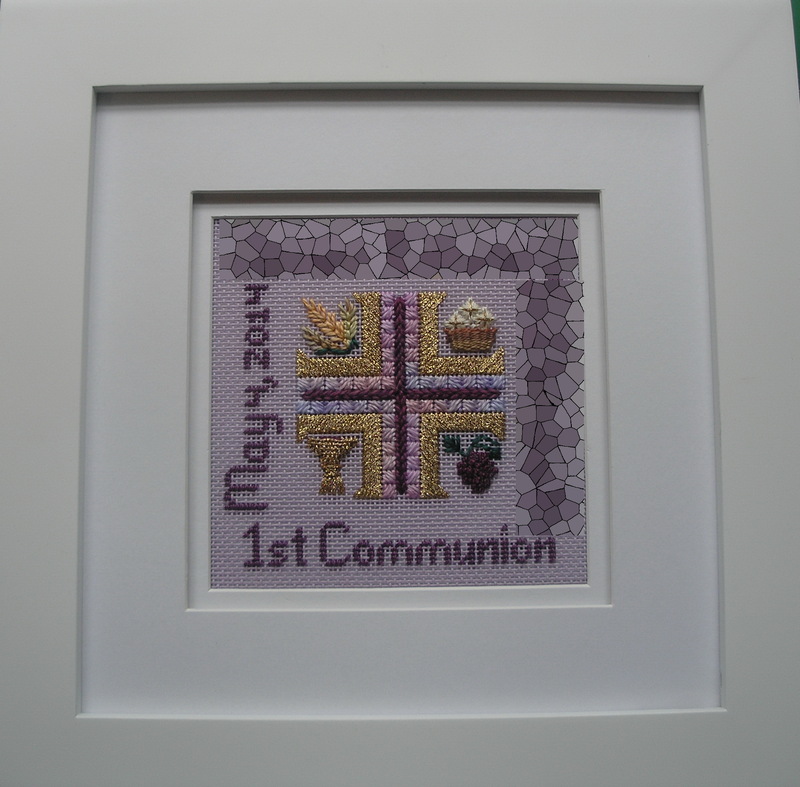 I found a frame and I have put the piece together and last Sunday one of my Grandsons received his own personal 1st Communion gift, a true gift from God. I blurred his name because I have a thing about kids names on the internet…especially little kids. Thank you God for this special project! Then in a misguided state of “You can do anything”, I decided to make a graduation needlepoint for his sister who is graduating from 8th grade this year. Border of course was easy…trusty alphabets. But that shamrock gave me a run for my needle. I had plotted it on the computer but for some reason was having more trouble with this design than the other; probably because I was second guessing myself. 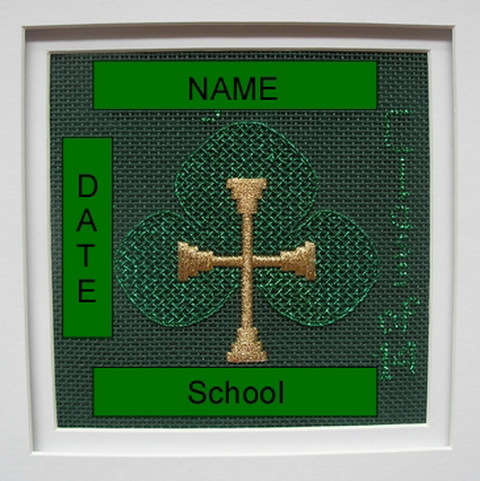 Then of course I did not have the right green ribbon for the cross, and none was to be found in town (I called) so I had to make an executive decision and I think I chose right. I had a multi green but I think it had too much blue; I like the gold better for the cross. But I persevered and this is her gift she will receive for graduation next week. And in-be-tween all this stitching I was writing stitch guides for pilot classes and the stitch guide for the 1st communion piece. 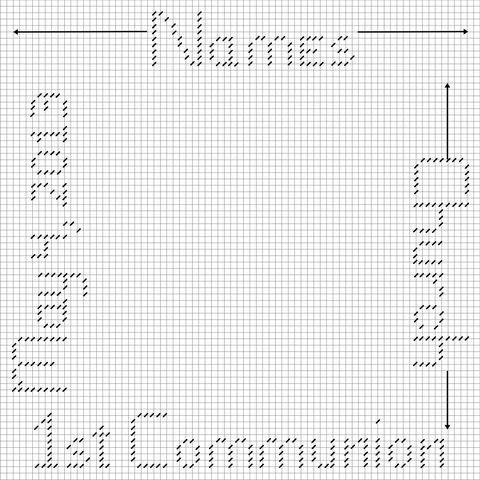 And since I know this 1st Communion design was a gift from God (I on my own do not work this fast)…I want to share the design with everyone. If you email me: sudu@kc.rr.com, send me your email and I will happily send you a PDF of the design. I just ask that if you stitch the design you send me a picture. All I can say is if the rest of my body worked out as much as my fingers have these past two weeks, I’d be in great shape. This week’s pace is a bit slower I have another pilot class to compute and always have something to stitch, but my fingers are not moving so fast.